02/27/2017 - The Hershey Bears hockey team announced that the organization will host the 2018 Outdoor Classic at Hersheypark Stadium on Saturday, January 20. The announcement was made in a pre-game ceremony by Bryan Helmer, Vice President of Hockey Operations, prior to puck drop of this past Saturday's contest versus Toronto at Giant Center. The Outdoor Classic will be the highlight event of the team’s 80th anniversary season in 2017-18. The Bears will face off against in-state rival, the Lehigh Valley Phantoms. Hershey Bears season ticket holders will have the first opportunity to purchase tickets to the 2018 Outdoor Classic with a pre-sale date to be announced. Information on a public on-sale date for ticket purchases for the 2018 Outdoor Classic will be announced at a later date. The 2018 Outdoor Classic comes exactly five years after Hershey last hosted an outdoor game. 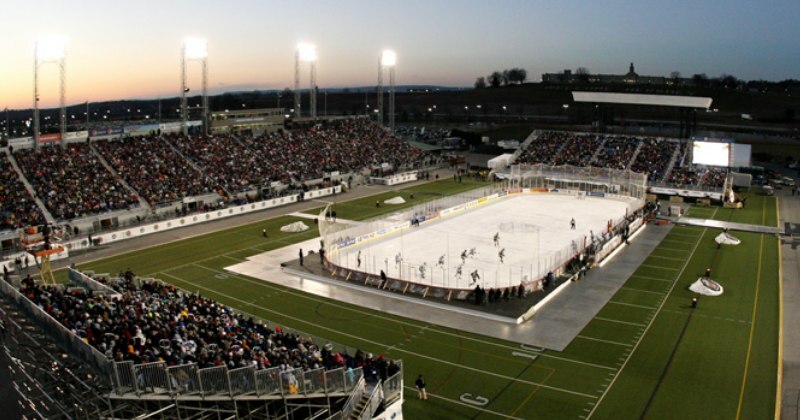 On January 20, 2013, Hershey celebrated its’ 75th anniversary season by hosting the 2013 Capital BlueCross AHL Outdoor Classic at Hersheypark Stadium. In front of 17,311 fans, Hershey fell to the Wilkes-Barre/Scranton Penguins, 2-1, in overtime. This is the third outdoor game in which Hershey has participated, and the second time Hershey has battled the Phantoms outdoors. The Bears played the Adirondack Phantoms at Citizens Bank Park in Philadelphia on January 6, 2012 in front of an AHL record 45,653 fans. The Bears fell in overtime in that contest, 4-3.